Place the salmon on a pan. Here we will be using either the deep flexipan or the medium silpat that we would have placed on the medium perforared sheet. Sprinkle some salt, pepper and drizzle a bit of lemon juice over the salmon. Cook in the oven for 8-10 minutes ( depending on how you like it). Add the salad to the dressing and toss well. Then add the salmon that you would have cut in smaller pieces. Place the salmon on a pan. Here we will be using either the deep flexipan or the medium silpat that we would have placed on the medium perforated sheet. Add the salad to the dressing and toss well. Then add the salmon that you would have cut in smaller pieces. I love, love sushi but my family besides my son does not like it at all. So at default of going to a sushi restaurant, I often buy some sushi at the Fresh market for Lunch. My top favorite is Spicy tuna, Spicy shrimps and Spicy crab salad in Fried Tofu. It is outstanding!!! One week, I craved that one so much that I actually purchased it three days in a row. It is not that expensive, but more than I really want to keep on spending so one day I just asked the Sushi Chef what he used to make the spicy sauce so that I too could make it at home. So now instead of buying it one, i can fix it myself at home as often as I want to eat it. Yeah!!!! Turn the oven to 400.Place the mini muffin tray onto a medium perforated sheet. Place one wonton in each mini muffin indentation, and push the wonton down so that it will lay flat. Spray some olive oil and cook them for about 5-7 minutes or until they are golden brown. Chop the crab, add the mayonnaise and the sriracha sauce and mix well. Set aside. Dice the avocado very thinly and season with a bit of salt and pepper. then spoon the spicy crab salad and top it all with a bit of ginger. Turn the oven to 400. Place the mini muffin on top of the medium perforated sheet. Place one wonton in each mini muffin indentation and push the wonton down so that it will be flat. Now it is time to assemble it. In each wonton cup, place a bit of the diced avocado, then spoon the spicy crab salad and top it all with a bit of ginger. Et voila!!! I love desserts, yummy scrumptious desserts. You probably figured out that from a few of my blog entries. But I also like to eat healthy because I feel better if I do, and i can still fit in my clothes that are 10 years old ( provided I still wear them, right???). 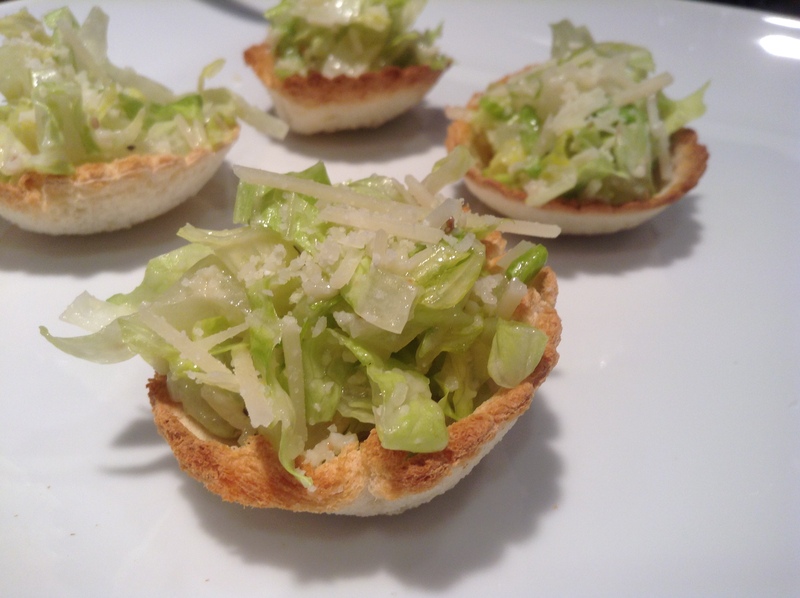 For one of the latest cooking class, i decided to make those caesar salad cups because they were different, and they presented vegetables in a fun way. The idea of using bread as a pie shell came from one of the book from Martha Stewart. She is so creative!!! 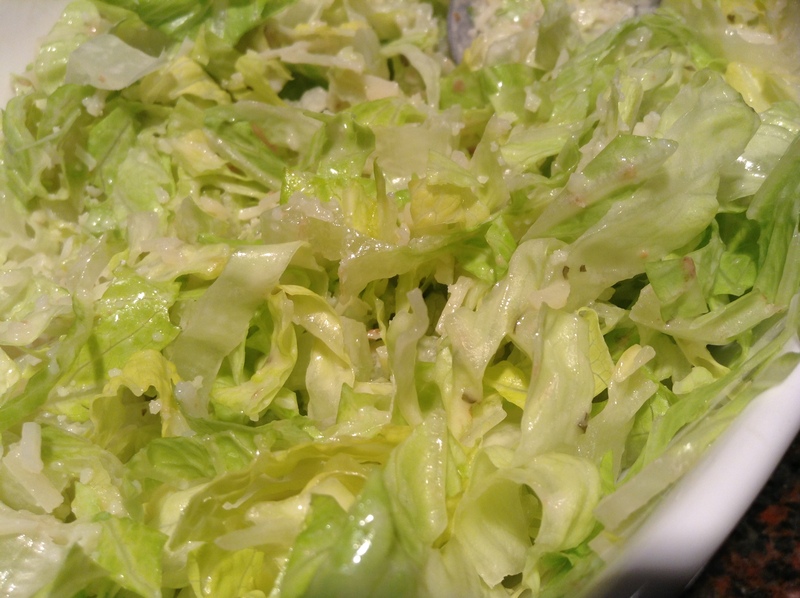 1/4 cup of caesar salad dressing. 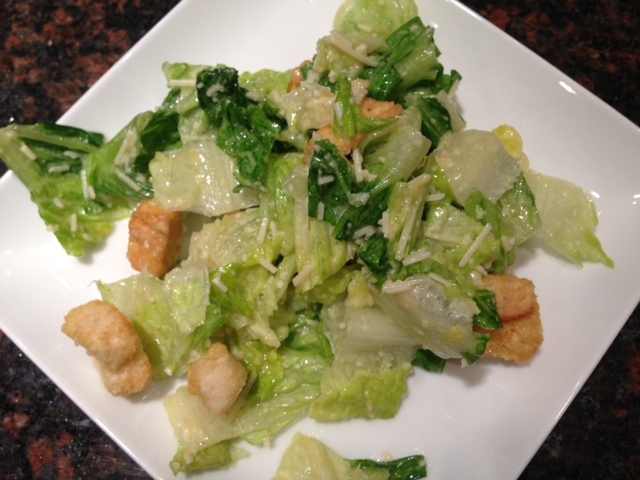 I used Creamy Caesar Salad dressing from Hidden Valley, but you can make your own. Recipe here. 1 loaf of sandwich bread of about 20 oz. ( or exactly 20 slices. Turn the oven to 400. Cut each slice into a round of 3 inch. 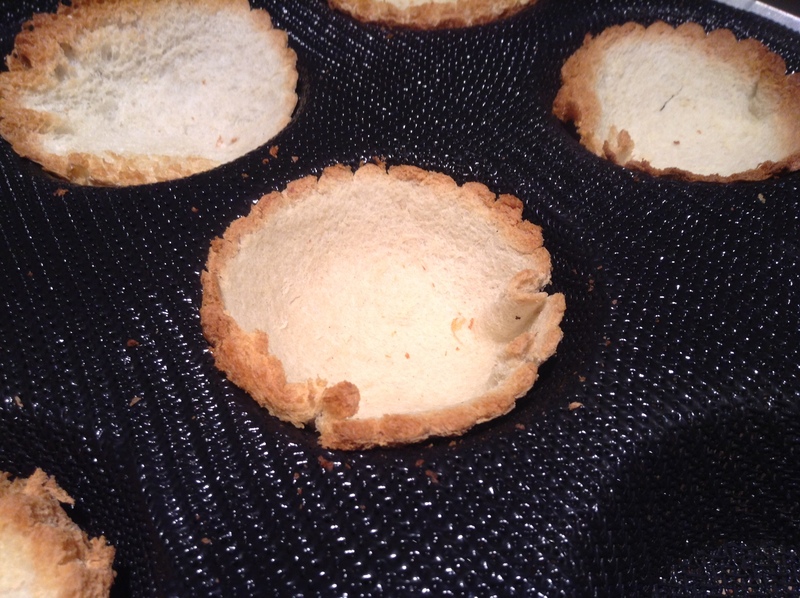 Place each round of bread in each indentation of the medium tartlet or the medium tartlet silform that you would have placed on a medium perforated sheet. Cook the tartlet for 6-8 minutes or until they are golden. 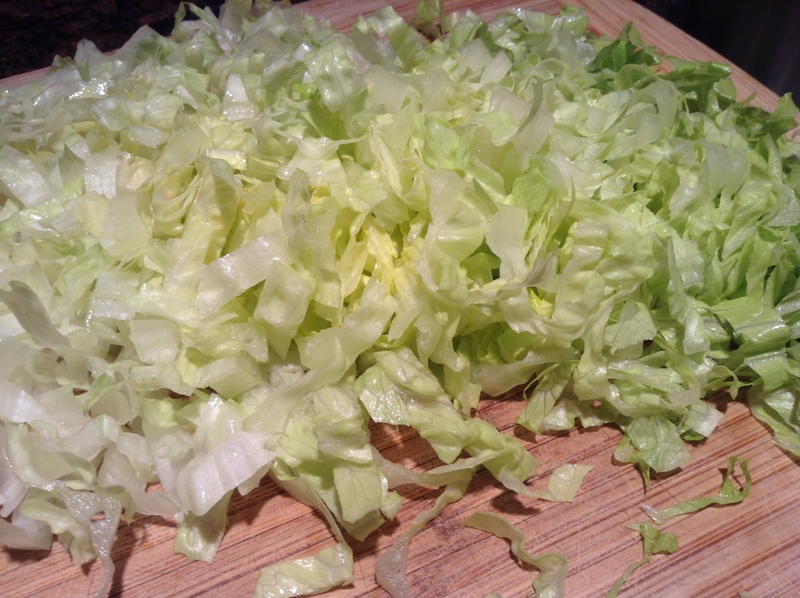 Meanwhile, chop the salad very thinly. Add the dressing and the parmesan and mix well. 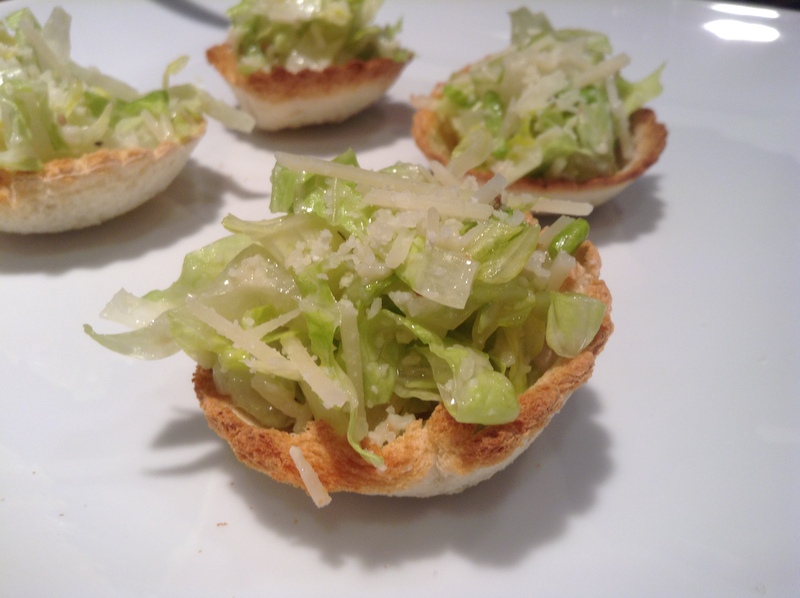 When the cups of bread are cooked, and completely cold, fill them up with the salad mixture. 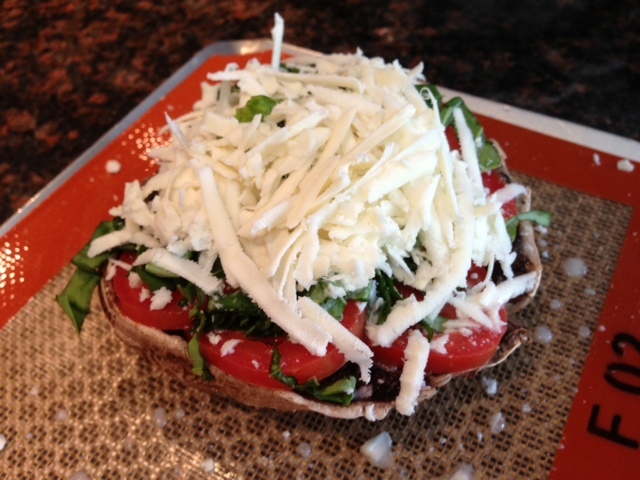 Sprinkle a bit of parmesan for decoration and enjoy! My daughter loves, loves caesar salad. She loves it so much, in fact, that every time we eat out ( which is not that often;-) she orders a caesar salad as an appetizer. In all the years that she has asked for them, I have come to realize what a good caesar salad is. 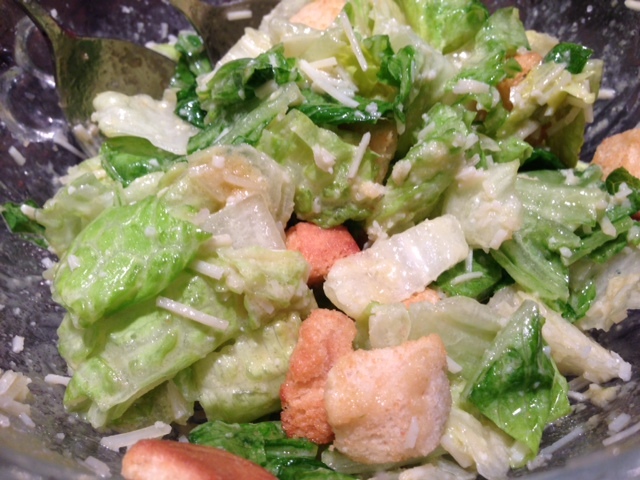 A good salad is not one that has chopped romaine lettuce, croutons, shredded parmesan and caesar dressing. Everybody can do that!!! 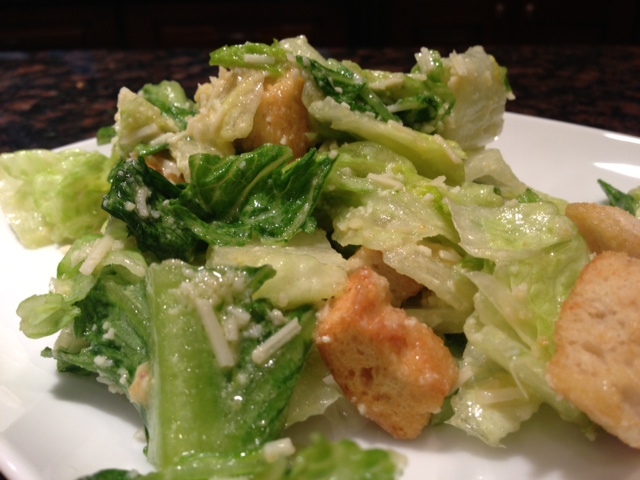 A good caesar salad needs to have a real caesar dressing made from scratch!!! Gerhard’s cafe, here in Spartanburg makes his from scratch and it is fabulous. My brother-in-law also makes a good one. I actually learned to make my dressing from him. Though in 20 years, my recipe may have changes a bit from his. In a large bowl, mix the garlic, anchovy paste, egg, lemon juice, and pepper together. In a slow stream pour the olive oil slowly in this mixture while whisking the dressing. Whisk until the dressing is thickening. Add the parmesan to the dressing and whisk. Add more salt, pepper or lemon juice if you deem necessary. 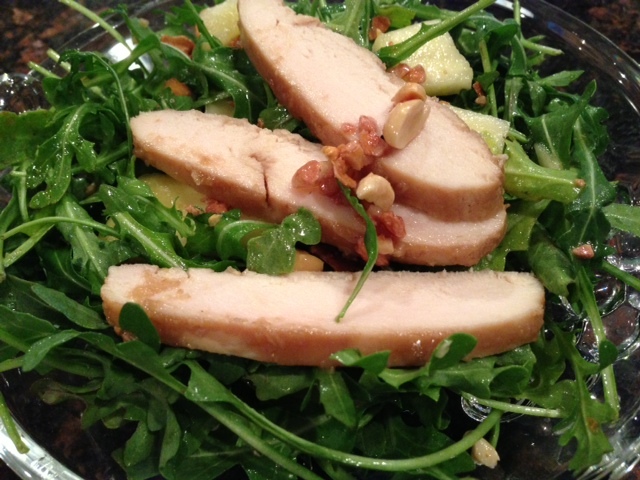 Add the chopped salad and toss. Add the croutons, the shredded parmesan and toss again. So easy and so yummy!!! This salad dressing will only keep for 1-2 day as the yolk is fresh and not cooked!!! Do not keep longer!!! I love mushrooms, but neither of my children like them so it is not often that i will have them for dinner. Sometimes I will fix sautéed mushrooms as a side to my dinner, but more so in the winter. Two days ago however, one of my customer, asked me to do a cooking class for her friends and asked that I do a vegetarian menu. 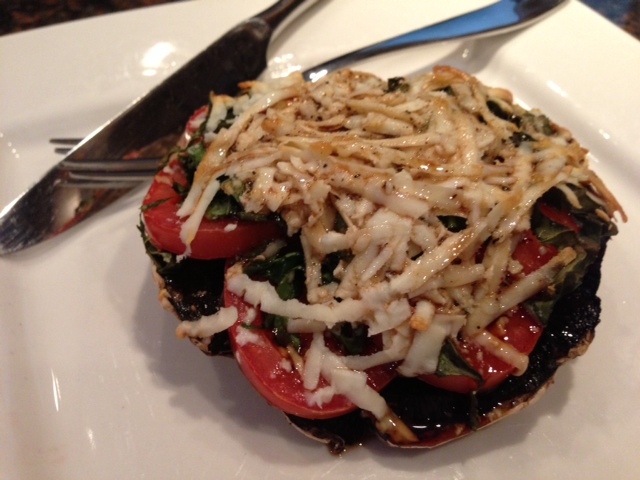 She even suggested that I presented a recipe of Portobello mushroom as the “main entrée”. I love Portobello mushroom but i never ever thought to fix them at home until them and had no clue what I was going to do. 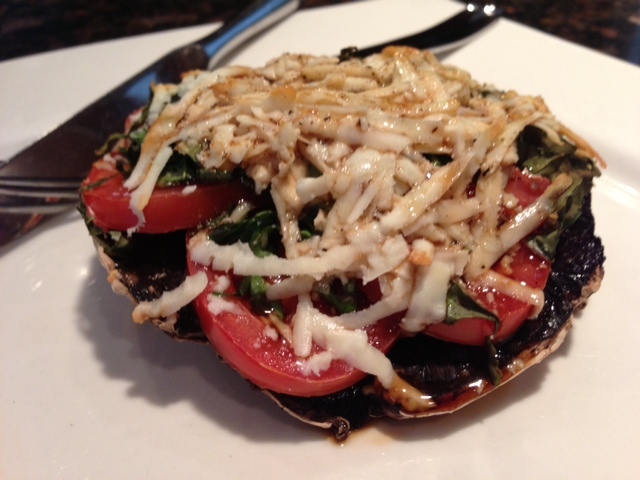 I guess I could have gone to a cookbook, or search for a recipe but instead i decided to duplicate a dish that was once my favorite: Gerhard’s Cafe Portobello Pizza. I said that this was once my favorite because they stopped offering this wonderful appetizer a few years ago. With a dry paper towel, wipe the mushroom clean. Place the mushroom face up on a silpat that you would have placed on a perforated sheet, or on a flexipat if you are fixing more than one. 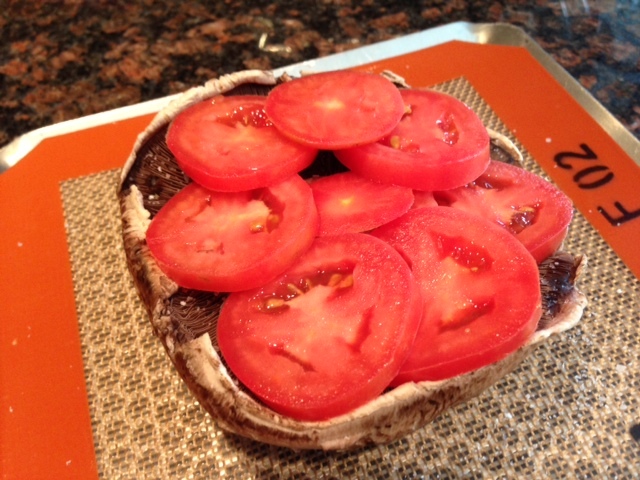 Place the tomatoes on top of the mushroom as shown below. Disperse the chopped basil over the tomatoes. 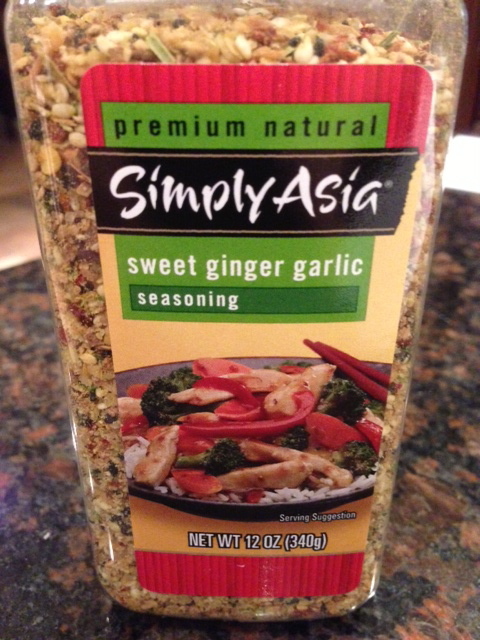 In a small bowl, mix the vinegar, oil, salt and pepper and drizzle this on top of the mushroom. Cook the mushroom in a warm oven of 400 for 15 minutes. Eat as soon as it comes out of the oven, as an entrée or appetizer. YUM!!! Trim the asparagus, then cut them in about 1/4″ pieces. Set aside. Place the corn in the large round mold, place the octogonal silpat on top of the round mold and cook it for 2 minutes. Cook, then trim the corn of the cobb. Add all the vegetables to the bowl where the dressing was made and toss the salad. 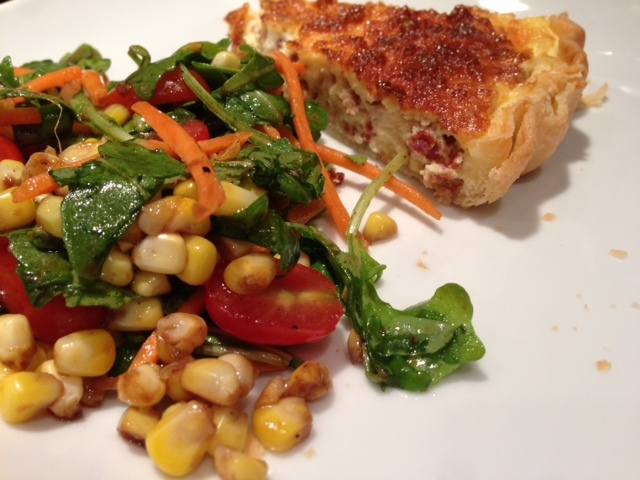 Serve on individual plates with a piece of Quiche Lorraine. If you read my previous posts, you may have seen the red curry Shrimps that I posted. Well I enjoyed that recipe so much that I decided to fix another curry dish a few days later. Except that that time I wanted to use green curry, sweet potato and pineapple. It was almost as good. 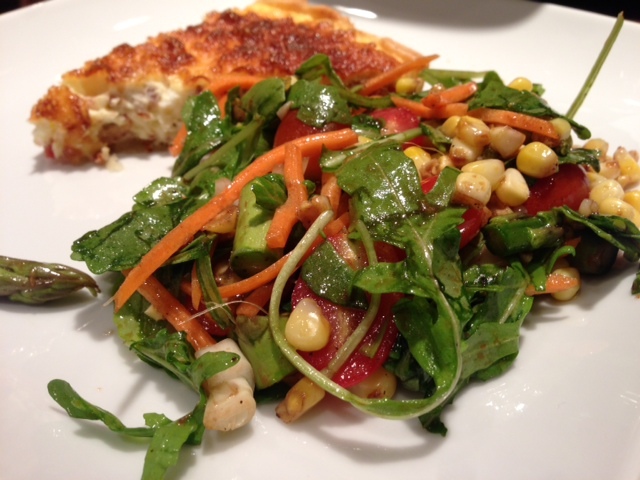 In a bowl, mix all the ingredients mentioned above for the dressing and with a fork or a whisk, mix the dressing. Add all the other ingredients and toss well.